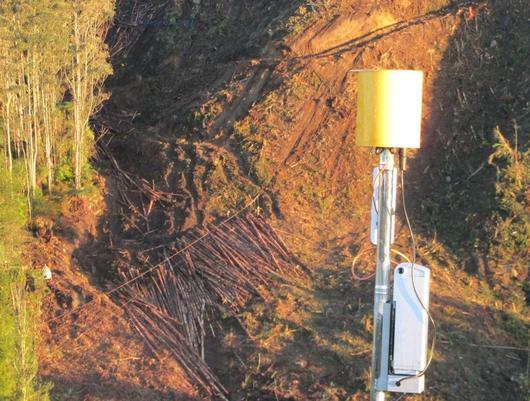 As part of the FFR Steep Slope Harvesting Programme, supported by the government's Primary Growth Partnership, Scion researchers have developed a cutover camera system to improve the safety and productivity of steep country forest harvesting operations. The CutoverCam hauler vision system has been tested in the field with contractors and is now available commercially. Breaking-out is one of the most dangerous logging activities, particularly in steep country where visibility between the hauler and ground operations is limited. The CutoverCam uses IP (Internet Protocol) camera technology to stream video of ground operations to the hauler operator. The hauler operator can pan, tilt and zoom the camera remotely to gain a clear view of ground operations on a screen mounted in the cab. This not only improves safety for breaker-outs, it also assists hauler productivity. Key features of the CutoverCam are joystick control and pan, tilt and 18x optical zoom. A wireless repeater allows the camera to be positioned out of line-of-sight from the hauler to improve the camera signal from steep terrain. An on screen warning alerts the hauler operator if the live video stream is interrupted. Clear visibility of the break-out zone allows greater engagement between the hauler operator and ground crew, improving overall safety of the break-out operation. Price is around $20,000 for the whole system including installation and training. Further details are available from Paul Milliken of Cutover Systems Ltd (info@cutoversystems.com or phone 07 349 4189).